There you are, the Jumbo and Brewerkz, already packed with customers in the early evening. 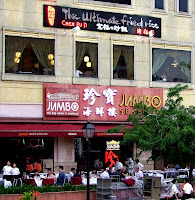 Jumbo must be seafood. Brewerkz is very popular with the American and European communities here. And the locals also made it their choiced watering hole. But I thought it sounded German. No, it's American food and all kinds of ale, beer and stout.